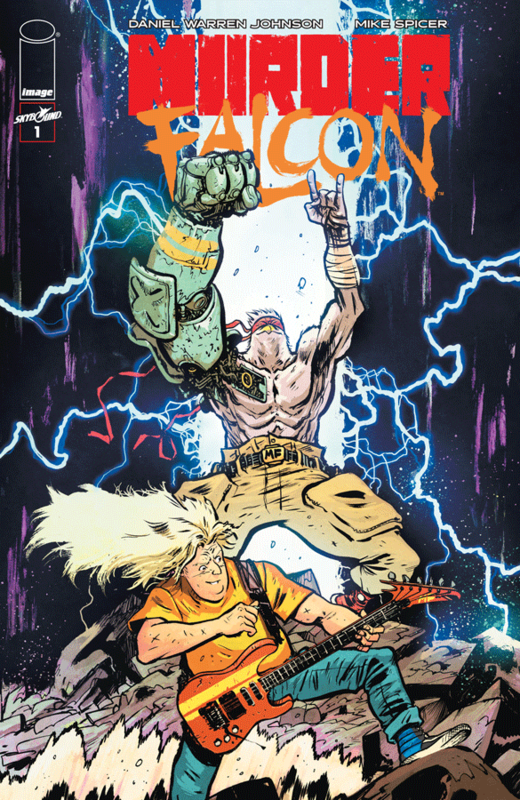 Welcome to the over the top, heavy metal, 80’s inspired action love letter that is ‘MURDER FALCON.’ Murder Falcon is written and drawn by Daniel Warren Johnson, published by Image Comics and is fantastic. Almost immediately you are put into a world of danger, action and monsters appearing and attacking the populace, our conventional means of defense useless such a threat… How can we stop such a force? Well, how about the power of Metal? Wielded by the hero of our story, ‘Jake’ A stout blonde haired man, hair-long like many great metal-heads before him. Well, how can music defeat this threat? A strum of his red and orange electric guitar creates a spark of lighting; these sparks cleverly create words you can see if observant enough. These sparks summoning ‘Murder Falcon’ our titular character, a mish-mash of 80’s action heroes, a red headband (Rambo) the face of a literal falcon, his appearance from a flash of light and smoke (The Terminator), brown cargo pants, and a belt with his initials adorned his buckle. *MF the name I will be using to help with time* MF has a truly unique design that can only come from the mind of Daniel Warren Johnson. Let’s not forget the most obvious design choice, his sizeable robotic right arm, amazing. Together our heroic duo battle the forces of evil, But… It wasn’t always this way. On this quest two weeks before our heroes grand entrance. We see Jake without direction, defeated… and the worst of this…Loss. Murder Falcon tells an interesting story inspired by numerous films and anime. The most obvious Pacific Rim, alas the monsters appearing and attacking the population, no conventional means of defense, and a breach(the tear), but done right. The pacing quickly puts you into it, the story slows down midway with it trying to make us feel for our hero, but then picks up almost right after. The artwork doesn’t stop, Daniel Warren Johnsons’ art is magnificent, his ability to draw monsters is second to none, his direction to action, you can feel the love this man has put on paper. So do yourself a favor and READ MURDER FALCON!